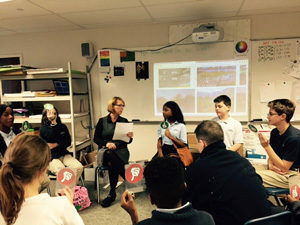 Advisory group/class is a place where our 5-8th grade students and their advisor come together as a family to share, to play, and to develop and enhance the well-being of the students. It is characterized by a sense of freedom and fosters a sense of belonging. Strengthens connectedness at the middle level. Advocates suggest a direct link between a student’s emotional and social experience and academic achievement. Research shows that advisory students are less likely to drop out and have a low incidence of substance abuse. Support all students in being successful academically, socially and personally. Foster a sense of belonging (in the group and the school). Foster a sense of self in each student and a sense of community. Throughput the school year advisory class should be working toward the ability to function as a huge listening group: attentive, appreciative of other’s individual uniqueness, helpful, caring. 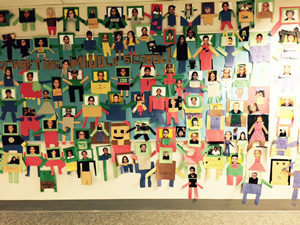 The theme for 5th grade Advisory/CCC is ”Minecrafting our way through Middle School.” Students were to create their own Minecraft character using words, or items that describe who they are. It was a way for students to get to know each other during their first few sessions of Advisory/CCC. Here at the Upper School students are participating in a series of bullying activities and discussions. Shown here is a group of students in their Advisory/CCC group discussing whether certain situations are bullying or not. The main criteria being any action that: intentionally inflicts physical or verbal hurt, is repetitive and involves a power difference between the students involved.